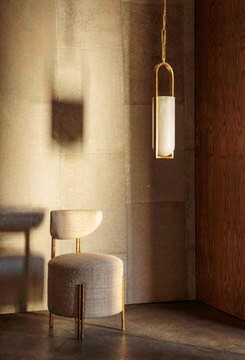 Attaining a seamless coexistence of form and function, the Larchmont Chair derives inspiration from Pre-Modernist architectural styles with particular attention paid to materiality and geometry. This chair features a square profile Stainless Steel frame in a Pewter Patina with Burnished Brass sleeving details. The upholstery is available in single or inside/outside two-tone options with a selection of curated fabrics and leathers. The Huntley Cabinet is composed of a blackened stainless steel body with a beautiful American walnut interior. Behind the four doors on the console portion, a moveable interior shelving is revealed while the stacked pyramid shape features drawers with traditional dovetail glides. Drawer and door fronts alternate between white parchment, artisanal clear seeded glass with antique mirror and burnished bronze, all adorned with hand-sculpted pulls. With its amorphous walnut frame, in both Natural and Ebonized finishes, the Finley Mirror is an unexpected organic take on a classic shape. The soft rounded profile of the frame holds a single piece of clear mirror. Hanging hardware is included.